I always liked Stuart Gibbs books because he is my favorite author. This is a action packed mystery. It is about Greg and his journey to save his parents of execution. This is wonderful read for people who like action and mystery. My only complaint is their isn't enough interaction with milady winter. Thoughts on the Overall Book: I love time travel books and I love the Three Musketeers, that should have made this great right? Well, actually that was the problem.Cover--Yea or Nay: I think it’s fine for the genre and age target of the book. I especially like the font, though I don’t really get the title.Characters: This was the problem. Okay, overall, Greg is not a bad protagonist. I don’t care for him being “the” D’Artagnan, but whatever, there were too many other things to care about. And even though he can do all kinds of useful things like fence and ride horses and climb walls, at least that was explained unlike in some time travel books by him going to fancy private schools. Okay, now for the characters from the original book:Athos: All right, we don’t know really what Athos was like as a teenager, but I don’t think he was quite as happy-go-lucky as he was portrayed in this book. Even though this was before Milady. Aramis: He was far too squeamish, and not nearly ruthless enough for Aramis. I think even as a teenager, Aramis would have been rather cunning. Porthos: Porthos was actually not quite so bad, but he is a pretty hard character to mess up. Even most of the bad movie versions of Three Musketeers have gotten him right when they didn’t get anyone else right.Richelieu and Richelieu: It took me forever to figure out there were two different Richelieus, I automatically assumed it would be THE Richelieu. and then I was proven wrong. Apparently he has a brother names DominicMilady: She wasn’t too bad, but not nearly as smart and cunning as Milady should be.Writing Style: It wasn’t amazing or bad, but frankly, I was too busy paying attention to the story to really notice it. There were some serious plot holes in this book though.Problems/What bothered me: Okay, there were so many problems, I’ll make bullet points. (Also, yes, I did take into account that this story was ‘supposedly’ the historical--though historical is a loose term to use for this book-- events that Dumas wrote the story from, but still. There could have been a ton of opportunities to write a really cool story for the musketeers and how they met! )-Athos was portrayed as a peasant in this story, he was actually a nobleman, in fact he was the richest of the four, and came from the most distinguished family. Porthos was a minor noble in the original, here, he is more like what Athos was supposed to be.Athos was blond in this book. Dumas clearly states that he had dark hair. No one ever seems to realize this.-People did not wear huge towering wigs in this time period. That was Georgian. -Athos was girl crazy in this story. Again, we don’t know what he was like before the Milady incident, but still. I took him to be a more sensible man than that even as a teen.-Aramis was way too shy around girls. Since it was a lady who was his downfall before he turned 20, we can only assume he was hardly a shrinking violet as a teen.-Milady is a handmaiden to the queen here. It’s been a while since I read Three Musketeers, but from my recollection, I think she should have been killing off her first husband here?-I don’t think people labeled their desk drawers in this time period, especially not with confidential info *dunce slap*-People didn’t have signatures in this time period? I didn’t know that!-As I said before, Aramis was too squeamish in this. He was seriously the most ruthless of the musketeers.-Boys their age would have drunk wine back then. It is very unlikely that Athos NEVER would have tasted wine considering the water supply they had. -There were not just pubs in lieu of restaurants back then either. There were many perfectly respectable inn/taverns to eat at.-Okay, no one can swim or climb in this time period? yeah, Swimming might have been a little uncommon, but not unheard of. I mean, if memory serves, Roman soldiers had to know how to swim.-Why is Aramis so amazed by Greg’s great-great grandfather’s book’s binding? If it was his great-great grandfather’s it probably wouldn’t have been bound too much differently as books in the musketeers time period. I don’t think they used the nowadays paste back then.-Aramis being sweet on Milady? I don’t think so. Not with how important the whole Athos/Milady relationship was to the whole Dumas story line.-Why the heck did Greg keep calling the time period medieval? Blimey, it wasn’t even the blasted Renaissance! (view spoiler)[Okay, so Richelieu's brother, Dominic, was actually Micheal Dinicoueur, D (I don’t feel like writing his whole name again) was immortal because he had used the stone from Greg’s mom’s necklace to dabble in the black arts. Or something like that, seriously that part of the plot was so lame and confusing I didn’t really understand it. Actually, it would have made more sense to use the famous Richelieu, instead of his long lost brother, I didn’t know even existed until now (to the author’s credit, he does, but why him?) -Also, the four’s plan to ‘trick’ Richelieu/D was totally unlikely. For one, Milady would never trust them if they told her to tell him, and two, even if she did, he wouldn’t believe it. I guess, though, I actually don’t know. -And then D meets his historic self, okay, we all know this NEVER goes well--meeting yourself when you time travel.-Another thing that bothered me. If immortal Richelieu/D escaped from the Bastille during the storming of it in the Revolution, then why did it take him sooo long to find out where the crystal was when he knew his son moved to America (which would have been seriously desperate in that time period) and found it long before the 21st century? Just one of many plot holes that didn’t make a lick of sense to me. (hide spoiler)]Conclusion: 2 stars. Marks for trying.Recommended Audience: If nothing else it was a good adventure story, though I didn’t enjoy it because of all the things that bothered me. It’s a guy read and would appeal to ages 10-12, if you liked the original Three Musketeers, this would drive you nuts though. As a Three Musketeers fan since I was twelve years old, I was of course excited to read this new time travel story, in which a 21st century boy travels back to France of the early 17th century, befriending the future musketeers, Athos, Porthos, and Aramis. Author Stuart Gibbs' fast paced, action-packed tale may well appeal to today's tweens, but I couldn't help but be disappointed in the way he interprets Dumas' classic story for the 21st century. The story starts off strong, with a terrific first sentence that will grab any young reader: "Clinging to the prison wall, Greg Rich realized how much he hated time travel." On a trip to Paris with his family to sell the family's treasured heirlooms to the Louvre, Greg and his parents are pulled through a time warp, winding up in 1615. When his parents are falsely imprisoned for trying to kill the young Louis XIII, Greg must rescue them--by meeting up with three teenagers like himself, Aramis, a young cleric, Athos, a soldier from the lower social classes, and Porthos, a foppish rich young nobleman who's the life of the party. Greg himself becomes known as D'Artagnan (in the original a fish-out-of-water himself, as a bumbling, hot-headed young man from the distant province of Gascony. Mix in a nefarious brother of Cardinal Richelieu (the Cardinal being a central character in Dumas' novel), and a young Milady de Winter (the original villainess in the Three Musketeers), some tropes of fantasy fiction (a stone that grants eternal life), and voila! a 21st century musketeer rehash.Gibbs does a good job with the whole fish-out-of-water time travel tropes, with Greg disgusted by the smells of Paris, the privies, and the fleas, among others. The book of matches in his pocket make the 17th century characters he meet think he's a magician, as does his ability to swim. There's plenty of action, as Greg and his new-found friends swashbuckle their way to saving Greg's parents. At the end, they don't go back to the 21st century, which makes me think that Gibbs has a sequel up his sleeve.While I can't help but appreciate any author that brings Dumas' characters to the attention of 21st century kids, I couldn't get over several changes to the original story that drove me crazy. First of all, the author keeps referring to Greg being in medieval Paris. While the streets of Paris might have been similar to the way they were in the Middle Ages, 1615 is definitely not considered the Middle Ages, and I wonder how such a glaring error could have escaped the Harper editors, not to mention the professor of French history who Gibbs thanks in his acknowledgment for vetting the manuscript. Second, and what bothered me more as a fan of the original novel, which I couldn't help wondering if Gibbs had actually read, he changed many key elements of the musketeers' personalities. For example, Athos, or the Conte de la Fere in the original, was a member of the nobility, not a common soldier, as Gibbs makes him out to be. Appearing as a young girl, the character of Milady de Winter doesn't make sense with that name, since she is supposed to have married an English lord after having been married to Athos as a young girl. Also, it's not very believable that 14-year old boys would be made guards of the king! Any young person who reads this and goes on to read the original Dumas is going to discoverer the many inconsistencies, which I just don't think were necessary. And by turning the somewhat ordinary Greg into D'Artagnan, Gibbs eliminated one of the funniest and most memorable characters in the book, the young Gascon around whom the plot unfolds. In short, while I enjoyed the concept of this story, I believe the execution could have been much better, simply by keeping more to the original outlines of Dumas' immortal characters. Unfortunately, I don't think that Gibbs' changes to the basic characters really added to the story, but rather detracted from it. It will be interesting to see if a sequel is in the making. Greg and his parents are traveling to Paris, but it isn't really a vacation. In order to survive financially, they are selling many family heirlooms to the Louvre, even though Greg's grandfather told them not to. The museum director is particularly keen to get Greg's mother's crystal necklace, even ripping it off her neck when she decides to keep it. The reason? He has the other half, and when the parts are reunited, all four are sent back in time to Paris in 1615. There, the director accuses the family of attempting to assassinate the king, and they are sent to jail. Greg manages to escape and gain sanctuary in a church, and is later befriended by Aramis, Porthos and Athos! Greg has his great-great grandfather's diary with him, and hopes that it will uncover the mystery, especially when he begins to think that the museum director and Richlieu are connected. Can he uncover the code in the diary, understand his family's background, and save his parents?Strengths: Good historical information about the living conditions during this time period, and a fair amount of action and adventure. I've often said that The Three Musketeers is a good story that needs to be retold for modern tastes.Weaknesses: This will be a hard sell, especially since it is very clearly the first book in a series. As much as I love time travel, students wrinkle their nose at it. I preferred this author's Belly Up, for the mystery and the unique and interesting setting. Engaging juvenile novel involving teenage versions of D'Artangion, Athos, Porthos, Aramis, Milady de Winter, and Louis XIII. Twisted around time travel and sorcery, this is a wonderful mix of Dumas characters, historical anachronisms, and the time travel paradox. While it probably owes more to Marty McFly than Robert Heinlein, this is a lot of fun. I love Stuart Gibbs, I've read all his books and they are all binge-reading worthy! This one is no exception! I have to admit I was spectacle at first, because I was never really into the medieval times, but when I started reading I couldn't stop! I will definitely read the other two books in the series! Interesting story line—not sure how close to Dumas’ original so now I have to go back and read that. Decent YA title—no romance, no foul language, no violent deaths. An imaginative look at the Paris of Louis XIII. This book is one of the best mystery books I’ve ever read. My favorite part was when Greg, his family and Michel Dinicoeur travel back through time. This book has everything you ever loved about a musketeer story (including all the things Dumas himself didn't do so well).It's swashbuckling beyond swashbuckling. The setting is not just portrayed, it's reveled in. Everybody seems to have a blade of some sort. The only females in the story are clever, exotic, and incomprehensible. There's loyalty, danger, hopeless causes, coded messages, secret meetings, improbable feats of daring, and it's made me a very happy reader.It's MUSKETEERS, y'all, the way they really should have been to begin with.They are chased across a cathedral rooftop or swing out a window on drapes or ambush someone down a dark cobblestone alley about every third page. Oh yeah -- and they're all around fourteen years old. This guy? He's jealous:There are problems. Time-travel....oh, yeah, did I mention that our hero is a time traveling kid from the twenty-first century?...comes with its own collection of possible problems, most of which the author blithely chooses to ignore because dwelling on it would cut down on the swashbuckling. There are a lot of gaps and things that don't quite add up. But it's written for boys of an age who probably won't notice, anyhow. I noticed the many plotholes, but was havin' too good a time swinging on chandeliers with dashing young swordsmen to care. "But if he calls us medieval one more time, I will run him through. For the love of all the saints, there was an entire renaissance between us and the medieval period! "image: Dear Mr. Gibbs, referring to the Baroque as being Medieval is identical in years to referring to Americans in our day as being Colonial Period Americans. Yes, really.The author sometimes falls into the fallacy of painting everybody in a given time or place with a very broad brush. "Surely nobody in this century ever tried to climb a wall!" (But I have to forgive him when our protagonist's rock-climbing hobby turns out to be so cool a skill.) "Nobody ever washed!" "Nobody ever swam!" "Everybody thought _______ without question!" But he manages to avoid the main crime of time travel stories! He chose not to portray the entire population of a past century as stupid or morally dwarfed....and bless him, he manages not to just make all the sympathetic characters magically implanted with twenty-first century ideals and values, so they can be 'good people' despite (ahem) being born in the past. They're just good people anyway.Not to mention the fact that somebody chose a time-travelling protagonist who is not the single person you know who is least suited to travel in time. Hooray!And I had a blast. Thank you, Mr. Gibbs. "I intend to read the sequels!" The Last Musketeer is a combination time travel/adventure story. It begins in the present with 14-year-old Greg Rich and his family arriving in Paris at the invitation of one Michel Dinicoeur. Monsieur Dinicoeur is an official at the Louvre (a famous art museum in Paris) and had contacted the Rich family–who is in dire financial straits–about acquiring the 17th-century antiques in their possession which had been passed down in their family for generations.Although Greg’s parents are trying to “spin” this visit to Paris as a family vacation, he is not fooled. He is also disturbed by the demeanor of Michel Dinicoeur when they finally meet him at a private entrance to the Louvre with the truck containing their family’s (now former) possessions. That’s why, when he accidentally discovers a diary written by his great-great-grandfather, Jacob Rich, hidden in the desk that–until now–has always been in his bedroom he hides it from Dinicoeur.Greg’s vague suspicions are proved correct when Dinicoeur causes himself, Greg, and his parents to be catapaulted back through time to medieval Paris. King Louis XIII is on the throne of France and the Louvre is in the process of being converted from a medieval fortress into a royal palace. Immediately upon arrival in 17th-century Paris Michel Dinicoeur has the authority to accuse Greg and his parents of treason and attempting to assassinate the king. Although Greg escapes into the streets of Paris, his parents are thrown into La Mort–the king’s dungeon–and sentenced to death in three days’ time.Completely out of his element in every way, Greg climbs the wall into the garden of the Cathedrale de Notre Dame and meets another 14-year-old boy, Aramis, one of the individuals destined to be immortalized as one of the Three Musketeers in the novel Alexandre Dumas will write in the 1840s. After befriending Aramis, Greg also encounters the other two future members of the Musketeers, Athos and Porthos. In asking for the help of his three new friends to rescue his parents Greg joins the four boys (he takes on the role of the fourth Musketeer, D’Artagnan) into the quartet of honest, stalwart heroes they will eventually become by helping to coin their catchphrase: “All for one and one for all!” (Dumas always claimed his stories of the Three Musketeers were based on actual people. )The pace of the boys’ adventure increases steadily throughout the narrative, ending in a spectacular climax! Without giving away the ending I WILL say that the book did not the way I expected and I am anxiously awaiting the June 2012 release of the sequel!As a student of French history, civilization and culture, specializing in 19th-century French feminist art, I am thrilled with the way medieval France leaps off the pages to encompass the reader completely. I highly recommend this book as a stand-alone adventure story. It’s also a terrific lead-in to the classic story of The Three Musketeers by Alexandre Dumas, or a unit on medieval French history. "These things are more important than you can possibly understand ... Do whatever it takes to protect them. "Greg's life is turning upside down. The family fortune has slowly dwindled over time and now Greg and his parents find themselves in real financial difficulties. Greg has had to leave his fancy prep school for a public school. "Back in Connecticut, his skills - horseback riding, fluent French, fencing - had at least made him interesting. At Carver High, they made him a freak. "Suddenly, all their troubles seem to be resolved. Michel Dinicoeur, Director of Renaissance Acquisitions at The Louvre, writes them a letter expressing interest in their antique furniture that has been handed down for generations. He wants to buy everything, including Mom's crystal necklace which looks like a broken shard more than anything. But didn't Greg's grandfather warn them about selling their inherited possessions? "He said never take them to France." When Greg reminds his parents of this, Mom and Dad simply think that grandpa's thoughts were no longer lucid.So, here they are unloading their furniture at the Louvre when Greg notices something about the old desk. On the backside, there are emblems of French royalty. As he explores, he finds a hidden compartment in which there is something that looks like a diary belonging to his great, great grandfather. "Hopefully, you will never have to confront Dominic, but if you do, there is something else you must know ... At that point, the entry ended." Then, something even more bizarre occurs. When his mother tries to change her mind about selling her crystal, Michel Dinicoeur goes crazy. "But that's the one I need!" He grabs the necklace and runs. Greg and his parents pursue and find themselves, suddenly, in 18th century France in the middle of the royal palace with the guards being summoned. Greg's parents urge him to run as it seems to be the only way he will be able to help them. A 21st century boy running from palace guards will be easily spotted, so Greg hides as quickly as he can, finding sanctuary at an abbey and meeting Aramis. Like the musketeer he's read about? Is that a coincidence?A fun time travel adventure for students. This book is a historical fantasy very loosely based on the setting of The Three Musketeers. As an adventure story, it is exciting and interesting. Its flaws entirely center around the aspects which are a pastiche of the Dumas novel. These are so serious that as a reader, I began to wonder if Stuart Gibbs had ever read the novel, or only seen a movie version of it.A typical example: many key points of the story center around the family of the Cardinal Richelieu, and Richelieu being the family name. Unfortunately, that was his TITLE, as Cardinal of Richelieu and Fronsac. The real family name, du Plessis, was overlooked by the author, and anyone knowing the Cardinal's real name will be utterly baffled by some of the anagrams and wordplays. The result is sort of like reading a story about the family of Henry the Eighth, and all of the descendent Eighths, as well as his brother, Fred Eighth. Gibbs also mentions the Bastille as being a prison, even though at the time of the Musketeers it was still a working fortress instead. Sloppy research or deliberate avoidance of its results slightly mar this otherwise good adventure story.That said, the story itself is mostly good, although this one involves so many time paradoxes that it may make your brain hurt. A family from the 21st century is dragged back through time by an evil museum director, because of a family heirloom. The rest of the book centers on the teenaged son trying to free his parents and prevent their execution. He meets many of the key characters from the Three Musketeers saga, and the action and adventure segments are clever, and work very well. The book leaves room for a sequel, but the time paradoxes created by this one probably have caused the collapse of the space-time continuum in which the story occurred, so there's no telling when or if it will come out. Grandpa Gus always told Greg that his family should never sell any of the old things in their home. “These heirlooms must always stay in our family, no matter what” “…These things are more important that you can possibly understand. …Do whatever it takes to protect them. And most important of all …never take them to France.” But now, 14 year old Greg’s family is no longer rich. And his parents have decided that the best way to get money is to sell the family’s heirlooms. To the Louvre. In France. Greg knows this isn’t right, but even he can’t imagine what ends up happening next – through the power of a magic crystal he and his parents, along with the shifty museum director Michel Dinicoeur, get sucked through a painting and end up in the Louvre in 1615. His family is immediately arrest for trying to assassination the king, and is going to be tossed into prison, the Trieste Mort. Greg manages to escape, and now is intent on getting his wrongfully accused parents out of the worst prison in France. But he can’t do it alone. And the help he finds is going to be even more famous than he expected – the Three Musketeers. Full of time travel, swashbuckling, mixed identities and magic, The Last Musketeer is a fast paced read that you won’t want to put down.___________________________I thought this was a fun romp, a not-so-serious, escapist read. The magic of the crystal was a little hard to believe and follow, as was the changing identities of Dinicoeur/Richelieu. But I enjoyed seeing the world of 1615 through modern eyes, and I think this would entice kids into finding out more about that time period and the original Three Musketeers. Grades 4-7: Greg Rich's family was once rich-- but his parents can't keep up the family estate any longer, and when the Louvre contacts them about selling the family heirlooms that date back to 17th century France, it sounds like a dream come true. They travel to Paris, where Greg is immediately distrustful of the strange Michel Dinicoeur, the Louvre representative who meets them. And with good cause-- once Dinicoeur gets his hands on a crystal that Greg's mother has always worn, he attempts to escape through a painting. Greg's family is swept through the painting as well, and they find themselves in the dark and smelly rooms of the Louvre 400 years ago. Greg manages to escape, but Dinicoeur holds his parents, and it is up to Greg to find a way to free them when they are injustly accused of trying to assassinate the king. Fortunately, Greg meets Aramis, who takes pity on the strangely-dressed boy of the 21st century. Greg has a suspicion that Aramis is one of the Three Musketeers that he read about, and this suspicion is confirmed when they later meet Athos and Porthos. Can Greg-- with the help of these Musketeers-- save his parents and stop Dinicoeur's evil plans? Although some of the plot twists are a little too coincidental, this is a fun romp that may inspire readers to get their hands on Dumas's original. Why I decided to read this book: I've never really had the time to find and read the 'Three Musketeers' but when I saw the cover and started reading it, I couldn't put the book down until the end :).This book completes the 'book that teaches me about another time in history' category of my book blog bingo board.It described Paris in 1615 as a poor place with a lot of hygiene problems.According to the story, back then there were no showers and towels and only bathtubs.My favourite quote(or rather a conversation) from this book is:'What is your name boy? ''My friends call me D'Artagnan(from Artagnan)''As a nickname I suppose.But what is your family name?''Pamplemousse. '(It was the first French word that popped into his head but he immediately regretted it. "Pamplemousse" meant grapefruit. )Porthos snickered beside him.This quote puts the slight touch of humour inside a book filled with thrill and action.Something new I learned from this book is that one of the most luxurious places in the world today was probably the most unhygienic around 400 years ago,where no towels or showers existed.A character in this book that was interesting to me was Porthos,one of the Musketeers.In this book, he is portrayed as a son from a noble family that joins Greg the main character in his journey. This is a fun adventure! Greg Rich's family has lost its riches and is pulled into the past - 17th century medieval France. Greg has to rescue his parents from Michel Dinicoeur and Triste Mort, the French dungeon where his parents are sentenced to execution for a framed attempted assassination of King Louis XIII. He is not alone in his attempt, as Greg - or, D'Artagnan - is joined by the Three Musketeers, each with their own personality!From the start, let me mention: I've never heard The Three Musketeers. So, I went into this story blind. Sure, I may have seen a movie adaptation when I was younger, but all I remember is scenes of swordfighting. That said, I enjoyed reading this. It was thrilling and exciting. While I don't think there is anything too spectacular about the read, it is a fun read. I'm sure the history isn't always authentic and Gibbs may have altered the original story, but this fictional interpretation was enjoyable. D'Artagnan pulled off some amazing and seemingly impossible feats in the story. The story has interesting themes of loyalty, friendship, and bravery. I liked the touch of magic and time-travel. While I did think this was fun, not sure if I would read the others. But for a younger crowd (elementary - middle school), boys and girls alike, can find enjoyment in this read. When Greg's family looses the vast majority of their fortune, they agree to meet with a curator of The Louvre and sell off many of their priceless goods, including a black crystal necklace that is low in monetary value but important to Greg's mother. At the last minute when she decides that she isn't interested in selling the necklace, the curator grabs it from her neck and jumps through a painting. Not hesitating or thinking, Greg and his family jump into the painting after the man and find themselves in the Louvre, but instead of it being 2011, it's 1615. Greg's parents are immediately hauled off to La Mort, a prison, but Greg miraculously escapes and begins to hatch a plan to free his parents from the terrible prison. It isn't long before he teams up with three boys, Aramis, Porthos, and Athos, who will become the famed Three Muskateers.Those looking for thought provoking prose and deeply drawn characters should look elsewhere, but this is a fun and exciting read for those who are able to suspend belief and accept all the unbelievable events that happen throughout the story. the last musketeer is about a boy and I forgot his name! So one day his parents decide to sell the stuff that they inherited, from his grandfather, to a museaum. When they arrive there his parents get thrown into a time portal by a guy whos name I've also forgotten. the boy has no clue what to do so he jumps in the portal in search of his parents and finds out that he landed in the past and he is suppose to make up the three musketeers and also rescue his parents from excecution and defeat a two people who are the same person but from different times. What will he do now?I picked this book up because it was new and it was a book I've never read before.I finished this book because it had lots of information about the three musketeers and because I really liked it.I would recommend this book to Mr. Gould because I know that he likes stories about king Arthur and the round table and the story of the three musketeers is similar to the stories of King Arthur. This time travel adventure plays into the idea that a boy, Greg Rich, from our time travels back into time and becomes the real D'Artagnan that helps to inspire the Three Musketeers stories by Dumas. It was a clever and fast-paced read that is definitely the beginning to a new series. The ending is not a cliff hanger but, Greg has not yet made it back to our time, so we know there will be more to come.I think Gibbs did a pretty good job with blending some outright crazinesss (e.g. Greg traveling back in time andDominic Richelieu is an immortal being) with some plausible story lines (e.g. Greg knows how to speak French due to private schooling and the other characters thinking he is from an area of France that is close to Spain because of his dialect). I can see kids who liked the Ranger's Apprentice and 39 Clues series enjoying this one because of the blend of action and history.I read this as an ARC and the book is scheduled to be released in late September of 2011. The Last Musketeer is a lot of fun! It is a time travel adventure that sees Greg Rich and his parents transported back in time from the present day to Paris of 1615. The Rich family has fallen on hard times and now they are selling off their antiques to the Louvre. The curator, a M. Dinicoeur, is very anxious to have the Rich’s treasures for the museum, in particular a necklace that Mrs. Rich is wearing. When she decides not to part with the necklace Dinicoeur snatches it from her neck and runs away into the warehouse. In the ensuing chase Dinicoeur jumps into an antique tapestry and the Rich family follows-and find themselves in 1615 Paris. Needless to say the adventure just begins, as Greg’s parents are captured by Dinicoeur, and Greg flees. He soon meets up with young Aramis, Athos and Porthos. 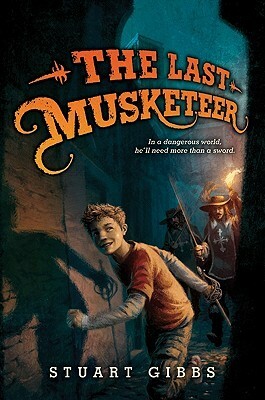 This is a great twist on the Three Musketeers story and an excellent middle grade novel, for boys especially. Well hmmm. LOVED Belly Up . Love the story of the Three Musketeers (and, I'll be honest, the Chris Donnelly, Keifer Sutherland, Charlie Sheen (EEEK! I DID JUST SAY THAT! ), and Oliver Platt movie version ... haven't seen the newer one yet). Love time travel stories.Didn't love this one and I'm not really even sure why. I guess ... a kid would need at least some background knowledge in the musketeers, wouldn't he/she? I mean, this one does explain some history. And there are some good action scenes in it.But I couldn't help but get a little annoyed by Greg. I can't prove why so this review is not much help. Just ... didn't like him so much.And her name was not Milady. That was her title! Greg and his parents are headed to France to sell all the family heirlooms; the family is bankrupt. When they sell the antique furniture to Michel Dinicouer, Dinicouer grabs the jewel necklace Greg's mother is wearing. She had decided to to sell that item, but that is what Michel wanted all along. Michel jumps into a painting and time-travels to 17th century France. Greg's parents follow him and Greg follows his parents. His parents are arrested for being assassins and Greg has to plan an escape for them. In the process he rustles up the Three Musketeers for assistance. The descriptions of France in the 17th century are honest and gross (which will appeal to young boys!). There is plenty of adventure, back-stabbing (figuratively) and plot twists to make this a very entertaining and mildly educational. A great choice for reluctant readers! I love Stuart Gibbs' Spy School series and I recently read the first in his Moon Base Alpha series and am looking forward to reading the second so I decided to give this series a chance.But alas, this isn't my cup of tea. I'm not big on time travel for one and there were a lot of time travel paradoxes. The characters, if you have read Dumas' novel, aren't as he portrayed them, which depending on how much of a fan you are may either be a slight annoyance or a major one. There are also quite a few historical inaccuracies. I'm not the biggest stickler for that sort of thing, but I do find them disconcerting. All in all the saving grace here is Stuart Gibbs' writing and the originality of the storyline. I will give it three stars out of five for that, but I won't be continuing with the series. A time-travel adventure with a new take on my old favorite, The Three Musketeers. 14-year-old Greg's parents have lost everything and are trying to get some money back by selling the family heirlooms to the Louvre. On a trip to Paris to take a bunch of stuff to its new home in the museum, they meet the villainous Michel Dinicouer and find themselves sucked back in time 400 years, where Greg's parents are on suspicion of plotting against the king, and Greg, now called D'Artagnan, must join forces with Porthos, Athos, and Aramis to free them before they're executed. A little predictable, but a good adventure. And who knows, maybe more kids will get interested in the original because of it. I love France and the time period of the musketeers, although I would probably say that I old want to live in a more glorified version of that time period. It seemed very down to earth and practical on the unhygienic practices of the time. It probably was more to do with the wow factor that young readers would get out of it than anything else but it did provide some comic relief. I am now going to have to go back and read all of Alexander Dumas' work to see how accurate this book was. This was a historical fantasy about how the musketeers met prior to them becoming the personal guard to the king. I like how it combined elements of time travel and history together. I read this soon after reading Belly Up by Stuart Gibbs, who wrote this book. I loved Belly Up, so I decided to give it a try. Pretty sure I liked it, but that was five years ago. I can't tell you what exactly it's about, but I'll give it three stars because it wasn't my favorite book. Greg Rich finds himself sucked back through time to early 1600's Paris where he must unite teenage musketeers to save his parents. A kids book that combines elements of fantasy with historical fiction, I enjoyed it, although I did find the set up a bit too long.Read my full review at Carstairs Considers. Greg and his parents go to Paris to sell their possessions to the Louvre. Michel D. meets them and steals the necklace from Greg's mother's neck. They chase Michel D. to a painting in the Louvre that lets Michel D. into it. They follow and find themselves in the past 1615. Greg's parents are thrown in prison. Greg escapes and as the days go by meets up with the teenage version of the three musketeers. They have an adventure rescuing Greg's parents.